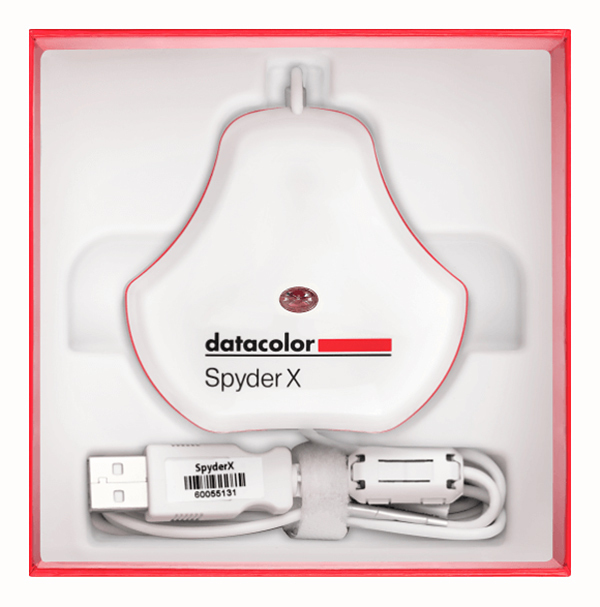 Datacolor’s Spyder X Elite colorimeter is effective, easy to use and well matched to the needs of both serious imaging enthusiasts and professional photographers. 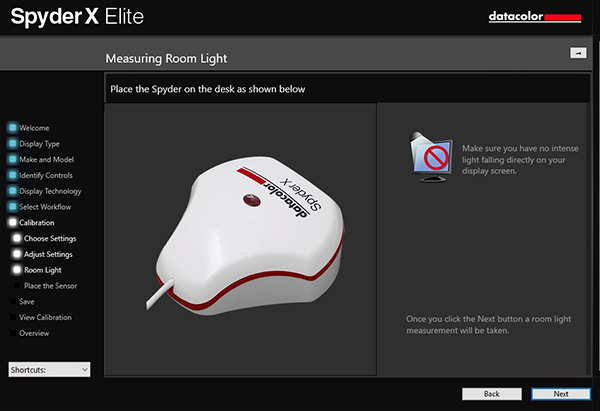 As well as adding some useful new features, the Spyder X Elite is much quicker than its predecessor, enabling us to complete a calibration in a couple of minutes. Datacolor’s new Spyder X is the latest version in a line of colorimeters that we’ve been using since we reviewed the Spyder2 in 2012. An updated version, the Spyder5, was announced in April, 2015. The latest version, announced in February 2019, features a significantly redesigned engine plus a change in body colour from black to white. Physically, the body design has been modified to make it sleeker looking and it now includes a tripod socket, for use when calibrating a projector. There have been a few important changes since the previous model, which was still available when this review was published. While there were three models in the Spyder5 range, the entry-level ‘Express’ model was dropped, leaving the Spyder X with two levels, Pro and Elite. The differences between these two models are retained, with the Elite model providing more advanced settings for professional photographers and videographers. The table below shows the differences in functionality between the two versions. We received the flagship Elite version for this review. Both models use the same hardware, which is supplied in a solid cardboard box with a moulded recess for holding the device safely. There’s a separate recess for holding the attached USB cable, which comes with a Velcro tie. The software must be downloaded from the Datacolor website, via a link that is printed on a registration slip in the top of the box. The Spyder X must be connected to your computer before the software can be activated, using the key printed in the base of the storage compartment. The device itself consists of two parts: the colorimeter and a clip-on protective base. In the top of the colorimeter is a separate light sensor, which is used for measuring ambient room brightness. 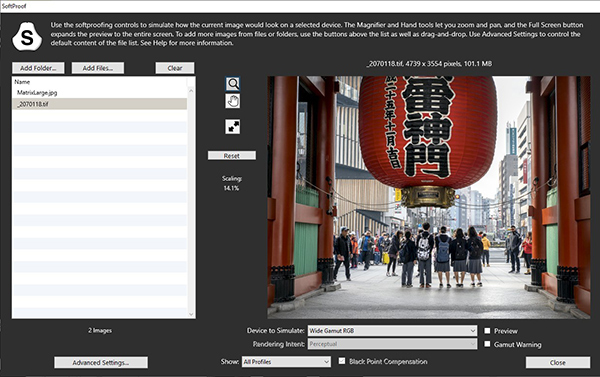 This feature enables users to adjust the brightness and contrast setting on their monitor(s) to ideal levels. It can also be set to provide warnings when there are significant variations in either setting. The Spyder X has a cord for connecting it to a computer. It ends with a USB A fitting that supports USB 1.1, USB 2.x and USB 3.x protocols and can be used with USB A>C adaptors that enable the device to be used with computers with faster USB C ports to take advantage of its higher operating speeds. We found the device worked perfectly when the USB cable was plugged into a USB hub. Purchasers of the Spyder X can now take advantage of a complimentary three-month membership to the Adobe Creative Cloud Photography plan once they have activated their software. It covers both Adobe Photoshop Lightroom CC and Adobe Photoshop CC. A colorimeter is an essential tool for anyone who wants to print their images as well as those who care about reproducing the colours and tones in their images accurately when they are displayed on a screen. For either situation, calibration is an essential first step towards ensuring the colours you see on your monitor correspond as closely as possible with those reproduced in prints or on other screens. Unless all devices in a workflow handle colour data the same way, there can be visible differences between the colour information a camera records, what the monitor displays and what the printer reproduces. Imaging technology has changed significantly in recent years, as has the way in which photographers view and display their pictures. New cameras offer higher resolution for both stills and movies, more people shoot to display on screens and we’re seeing increasing choice in screen sizes and resolutions along with improvements in display and printing technologies. All these factors mean consistency from capture through production to output has never been more important. Monitor calibration provides the figures (in the form of profiles) that enable the different values from each device to interact and produce a predictable output. 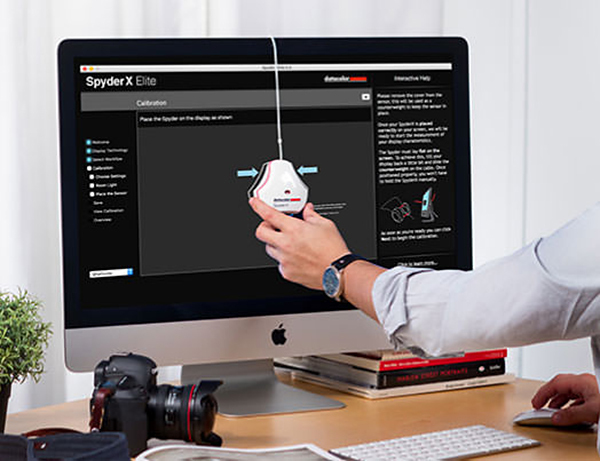 The redesigned processing engine in the new Spyder X makes calibration much faster than with the Spyder5 it replaces. 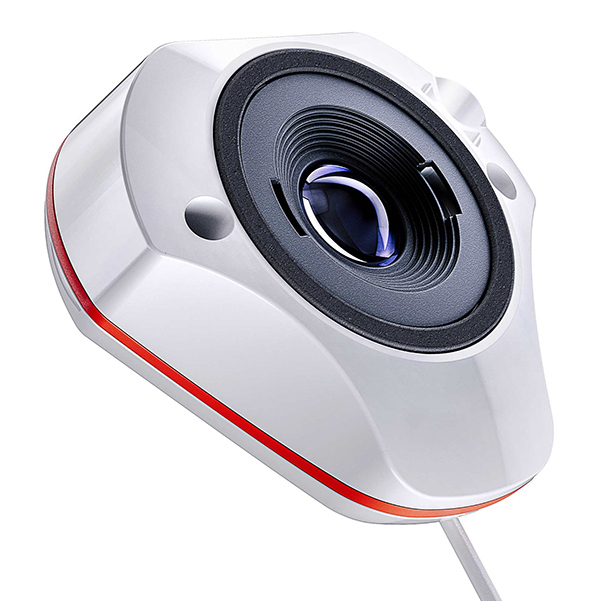 It also provides improved colour accuracy and better low light capability, thanks to a larger lens that covers its internal sensors and focuses light more precisely. The method of using the Spyder X is essentially unchanged and the software interface is much the same as the Spyder5’s. It’s a simple process and on-screen guides are provided to take novice users from step to step. It’s best to work in subdued lighting without any colour bias. The first step normally includes measuring ambient brightness, which is done once the software has been installed and the Spyder X is connected to a computer. This process can also be accessed via the Expert Console (see below). 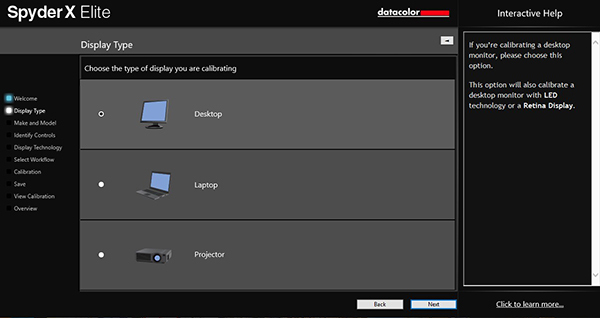 The calibrator head slides along the USB cable when it is positioned on a monitor screen. The base acts as a counterweight and hangs behind the monitor that is being calibrated. Tilting the screen slightly backwards ensures a good contact between the measurement device and the screen and minimises potential effects of stray light affecting the readings. 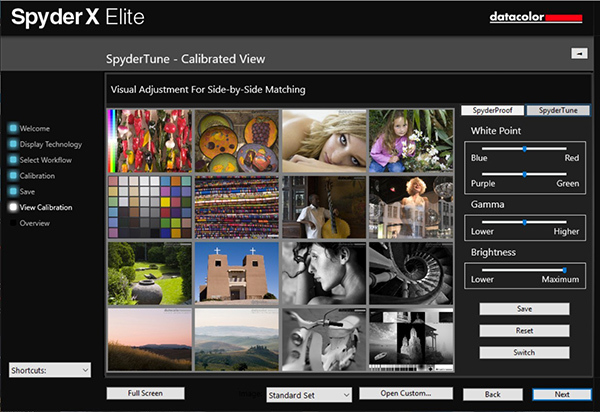 The software hasn’t changed much since the Spyder5, although there have been a few subtle refinements and a new soft proofing facility has been added to the Spyder X Elite software. This includes some sample profiles, although it would normally be used with the printer profiles stored in your computer. The Welcome screen in the normal mode with the new soft proofing option. 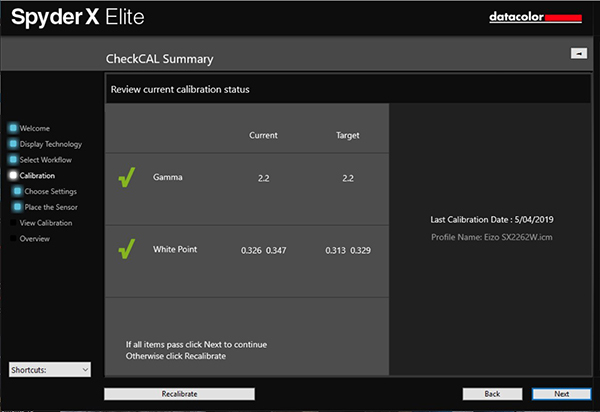 The next screen outlines the conditions that must be met before starting on the calibration process. Each of the boxes must be checked before the next screen can be opened. 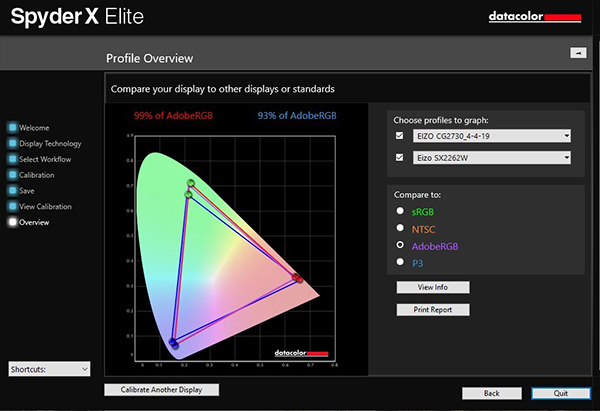 The next screen lets you select the type of display you will be calibrating. 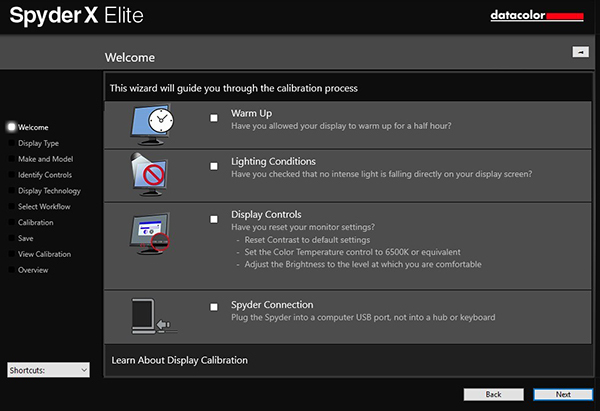 Note the Interactive Help screen which shows which type of screens can be calibrated. The next screen is for identifying the make and model of your screen. 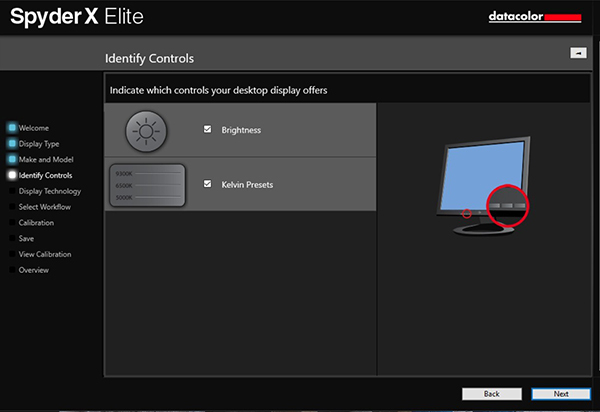 You must then check which controls your desktop display offers. The next step is to identify the technology used in the display. We found the software correctly selected Wide LED for the screen we were calibrating. 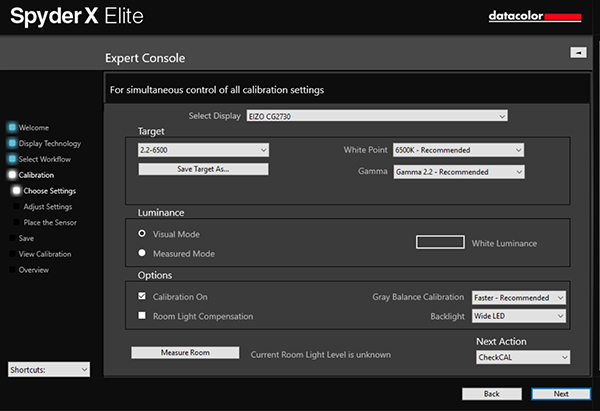 At this point, selecting the Expert Console will give you control over all the calibration settings on a single page, allowing you to set up to key measurement parameters. It also allows you to measure the ambient lighting in the workspace. The result of the room light measurement showing the light level was appropriate for photo editing and providing recommended target settings. The next step is to place the Spyder on the marked position on the screen before clicking on ‘Next’ to initiate the measurement sequence. During calibration the software will display a succession of screens filled with different colours, ranging from white through to black, measuring each one before moving to the next. The software will notify you if the current screen brightness is more than 4% off the desired value and prompt you to adjust the screen brightness accordingly. You can track progress with the green line in the lower part of the screen. 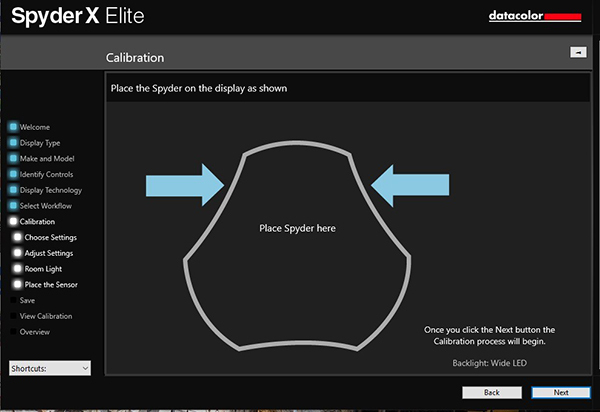 At the end of the calibration process, the software will prompt you to remove the Spyder from the screen and display a displays a page where you can name and save the new profile. Usually the displayed name correlates with the name of the screen you are profiling. We recommend adding the date to the profile name before saving it. Clicking on ‘Save’ stores the profile in the appropriate folder on your computer, where it will be accessible by all applications involving colour reproduction. You can also set a reminder of when to recalibrate your display. For most photographers, the default frequency setting of one month should be adequate. 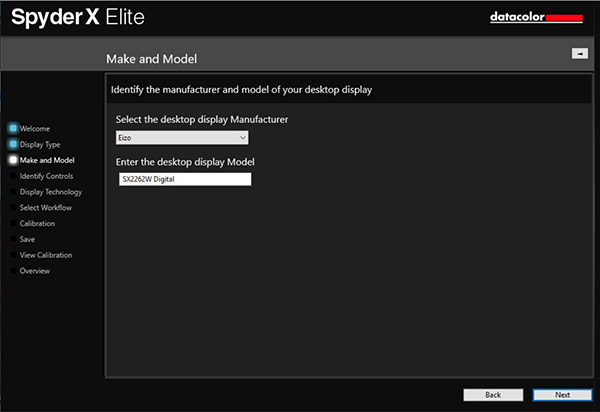 Clicking on Next creates a profile overview that enables you to compare your newly-created display profile to other displays or standards. You compare the colour gamut coverage of two monitors. 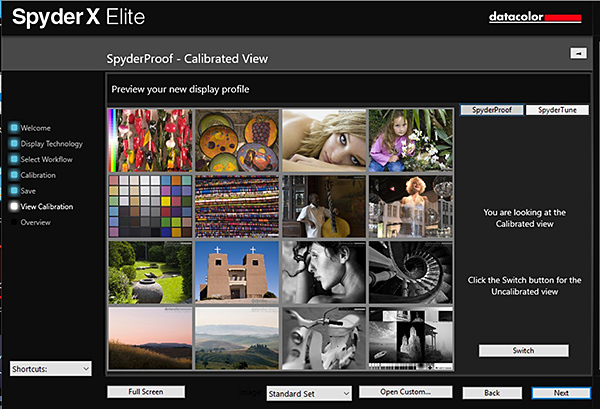 Clicking on the Next button takes you to SpyderProof, where you can view the effects of the calibration on a 4 x 4 block of sample images that includes colour patches, landscapes, skin tones, high-dynamic range subjects and monochromes. You can click inside an image to zoom into it for more detail and switch between calibrated and uncalibrated views to see how the changes affect these images. As you can see from the screen grabs below, there wasn’t much difference between the calibrated and uncalibrated views of our screen. If the SpyderProof screen suggests your display needs adjustment, clicking on the SpyderTune bar will provide the same set of image samples plus sliders for adjusting blue-red and purple-green to tweak White Point adjustment. There’s also a lower-higher slider for adjusting Gamma (contrast) and a lower-maximum slider for Brightness. The adjustments available in the SpyderTune facility. These adjustments can also be used to fine tune a second display to match your master. Any adjustment you’ve made can be saved for future use or the values can be reset. You can also retune either screen without spoiling the profile of the screen you’re not working on. Both versions of the Spyder X include time-saving ReCAL and CheckCAL modes that can recalibrate or check a current calibration without requiring a full calibration routine. They use the same wizard-based routine but involve fewer measurements so they’re even faster. The CheckCAL process is the faster of the two. On completion it displays the screen shown above with status checks for Gamma and White Point. There’s a Recalibrate button below the status display that takes you to the start of the calibration wizard should either parameter be out-of-whack. The Spyder X provides a new soft proofing function that lets you simulate how an image will look when printed on a specified printer with a selected paper profile or how it will display on a monitor or TV screen. Selecting the soft proofing option. 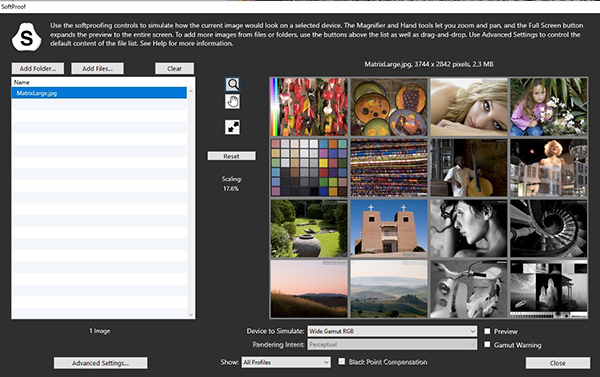 The default setting shows the Datacolor test image matrix with the MatrixLarge.jpg file loaded in the profiles list. You can use this as a starting point for soft proofing before selecting other profiles and controls to preview device simulation. The software covers your own printer, a retail printer and a tablet simulation, the latter for photographers who want to display their pictures on an iPad or other tablet. 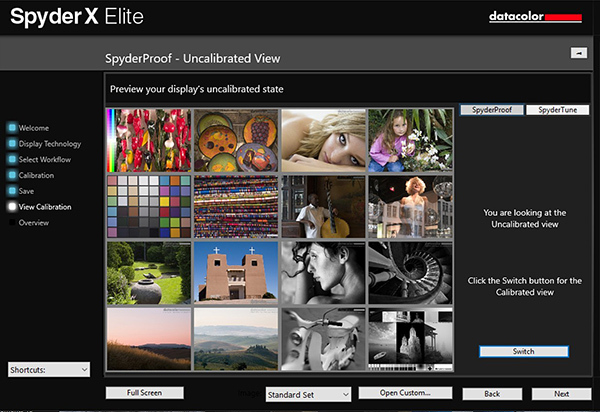 The initial soft proofing interface, showing the test image matrix and profile selection. – Click the Add Folder or Add Files button above the list to select which image file(s) you want to add to the list. – Drag-and-drop a folder/file from the operating system into either the list or the preview area, and images from folders (with subfolder contents included) or files will be added. 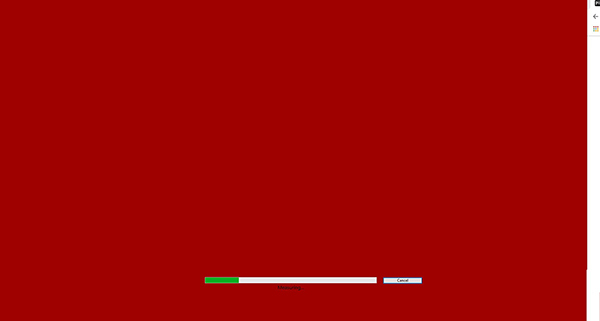 Loading an image into the preview area. Initially, the preview image will be displayed with its original colours, without any device simulation. You can zoom in with the Magnifier tool, use the arrows to move around or click and drag a selection rectangle to examine areas more closely. The Advanced Settings dialog box. 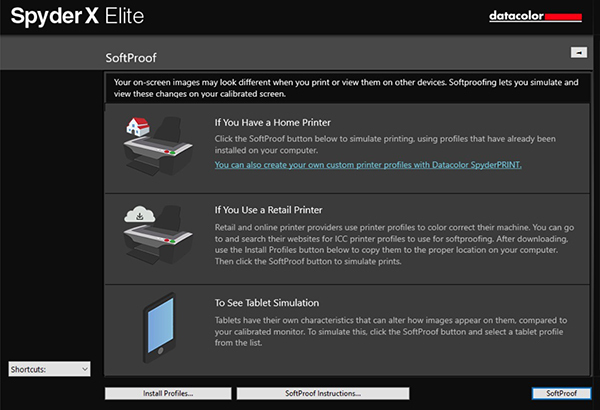 The Advanced Settings box below the list allows you to change the default preview list from the MatrixLarge.jpg to a different folder/file to load every time Softproof is opened. Before the test image can be displayed as a soft proof, the printer profile and rendering intent need to be set. 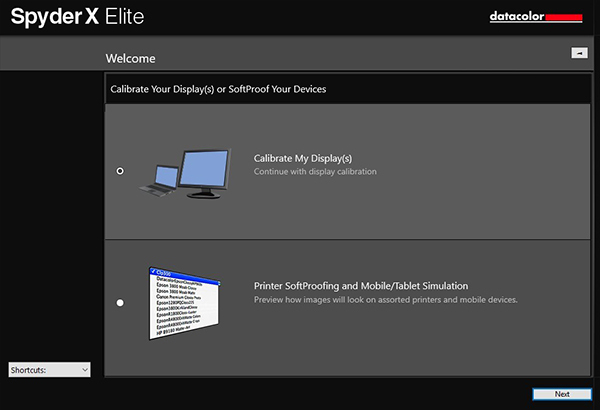 Profiles are selected from the Device Simulation popup list, which accesses all the profiles loaded in your computer. A box below provides the rendering intent options. Checking the Preview box displays the preview image with colours and tones rendered as closely as possible to the end result you can expect, given the differences in dynamic ranges between screen and paper. Checking the Gamut Warning box lets you display areas in the image that will be out of gamut for the printer and paper combination. Note that some printers can produce colours that can’t be viewed on the average display with a normal gamut (although a wide gamut display should potentially handle them). Some displays can’t reproduce certain colours without reducing their saturation (wider gamut colors on a smaller gamut display). Soft proofing with gamut warning is a way of “seeing” these issues indirectly, even if they may not be directly visible on your calibrated display – or in the prints you make. By default, the gamut warning colour is set to 50% grey. It can be changed in the Advanced Settings box. The display analysis tests in the Advanced dropdown menu are the same as in the Spyder5 software and just as useful for determining how well your monitor is performing. We routinely use these analyses when testing the monitors we review. 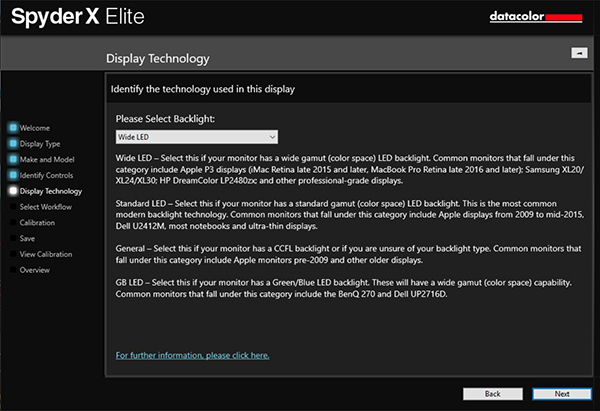 You can see what it does by reading any of the reviews in the Monitors page on the Photo Review website. 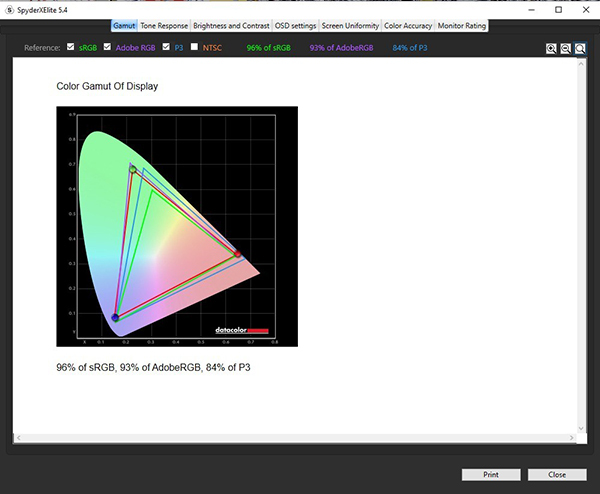 The Display Analysis facility lets you check six critical parameters: gamut, tone response, brightness and contrast, white point at different on-screen display settings, screen uniformity and colour accuracy. You can check as many as you like. 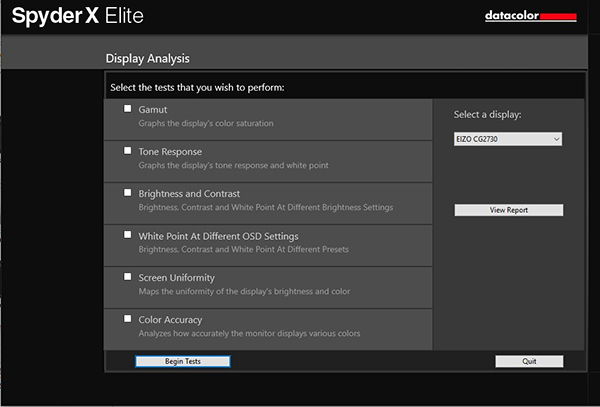 The tests available in the Display Analysis. The colorimeter is used to measure each parameter tested once you’ve clicked on the Begin Tests button. Results of each test can be accessed via tabs above a display screen that appears when the tests are completed. They can be saved to your computer or printed out. The combined results from the tests are delivered in individual pages, accessed through tabs along the top of the screen. 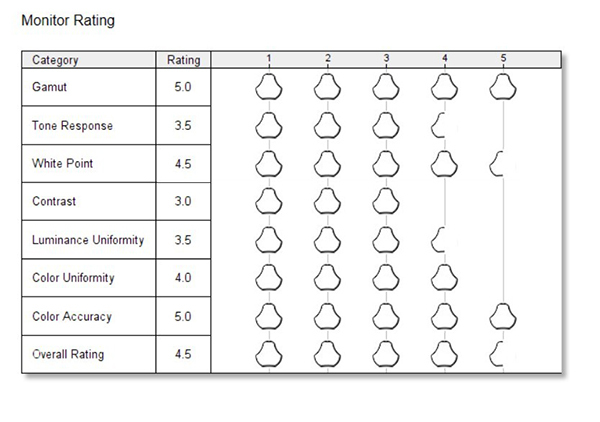 They are summarised in the final tab, which provides a graphical ‘Monitor Rating’. In the box: SpyderX sensor, Welcome Card with link to software download and warranty information, Unique serial number to activate software, Link to online demonstrations, user guide, videos and support.